Not even a pat on the back from the club mascot could cheer up United goalkeeper Adam Bartlett. 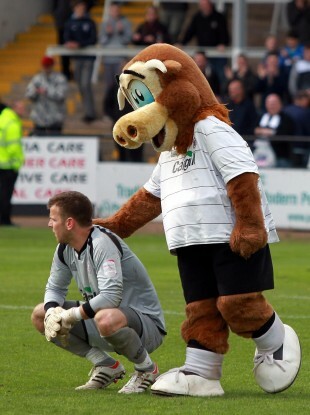 Hereford goalkeeper is comforted by the club mascot after their relegation. A CONSOLING COW-PAT on the back from Hereford United’s bull mascot was scant consolation to goalkeeper Adam Bartlett after his side were relegated from the Football League. Hereford beat Torquay 3-2 in their final match of the season in League Two but it was not enough to stave off the dreaded drop. Barnet maintained their league status with a 2-1 win at Burton Albion thanks to goals from Mark Byrne and Mark Hughes. Goals from Delroy Facey, Harry Pell and Robbie Purdie put Hereford 3-0 up before a late Torquay comeback. However, United fans knew their fate was sealed at the final whistle as they discovered that results elsewhere had went against them. Former Hereford United players of note include Ireland’s Kevin Sheedy and England striker Steve Bull. They will join Macclesfield Town in playing non-league football next season while there was better news for Crawley Town. Their 1-0 win over Accrington, managed by former Sligo Rovers boss Paul Cook, saw them promoted along with Shewsbury and Swindon. Email “A load of bull: Hereford relegated from Football League despite final day win”. Feedback on “A load of bull: Hereford relegated from Football League despite final day win”.